The present Mughal voided velvet is a North Indian 17th century piece with a perfectly symmetric pattern. The deep red velvet reflects a rich pink-purple sheen, the luxuriant quality of the silk thread. The pattern is formed of rosettes, saz leaves and carnations, each containing intricate velvet lines that meticulously draw their petals and leaf veins. The pattern reveals an inspiration in 16th century velvets from North Italy, which had been circulating in India according to Portuguese and Dutch traders in the subcontinent. Woven silks from Northern Italy, such as those illustrated in Rosalia Bonito Fanelli’s Five Centuries of Italian Textiles 1300-1800 (Museo del Tessuto, Prato, 75.1.257 and 75.1.254) illustrate the influence that Italian fabrics had on the Indian textile craftsmanship. 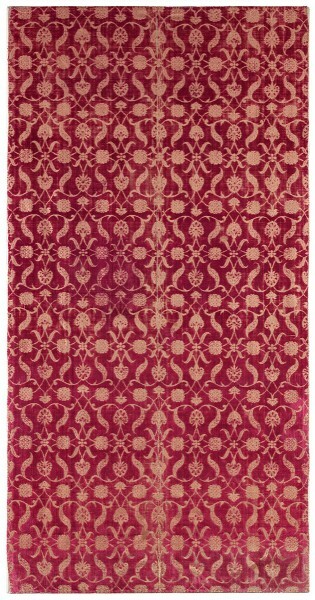 A comparable example of a 17th century North Indian velvet with a solid colour ground, and not a metal-wrapped ground, is in the collection of the Museu Calouste Gulbenkian in Lisbon (no. 1450). We would like to thank Dr Jon Thompson and Dr Steven Cohen for their expertise on the present piece.